Our process for building a custom pool or spa starts with a bunch of questions. We sit down with you and/or your builder/designer to understand what you are looking for—the lifestyle needs, and the property needs. What kind of land do you have? Where is the view? How big is your family? Will you be entertaining frequently around the pool or spa? All these—and more—are the questions we explore as we begin the process with you. We work with our clients to make sure that they have a thorough understanding of their rights and responsibilities, both as we build the pool and throughout their ownership. Pool ownership requires education, and we are focused on making sure our customers and their caretakers understand their pools. We encourage people to think about future needs and uses of the pool and its surrounding environment before finalizing plans. This helps our clients realize the grander picture and longevity of this project that can increase their enjoyment and comfort not just for immediate desires but for years to come. We work with our clients on project management, design, and construction. When your pool is completed, we offer service to keep your pool performing beautifully. We've built over 300 pools—one at a time. 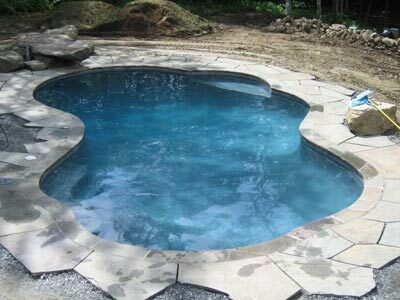 Building a custom pool is a major undertaking, and we pay close attention to the specifications, timeline, and details. Denise manages every project with the goal of bringing it in on time and on budget—and with a positive, respectful experience for everyone involved. We don't make very many promises—but we keep every promise we make. And one of our promises is that you will enjoy your pool for many decades to come! Typically we book and sign contracts 6-9 months in advance. The short northeastern building season means that most clients begin planning the year before their pool is constructed. We set project dates by contract, rather than deposits; we are making a commitment to your project, and you are making a commitment to go forward with the work. We once had a client sketch their pool on a napkin—we scanned it into the computer and we built it. We can design your dream pool or spa for you, but we are equally happy to work with your architect, builder, landscape architect or designer to help execute the vision you have for your family. We save the landscape and patio design for the experts—but we will focus on the effective and beautiful design of your pool or spa to complement the entire collaborative vision. For those of you just wanting a simple pool, we can do that without the need for other expertise.